The Target Marketing Systems 24-Inch Set of 2 Ladder Back Stools with Rush Seats and Turned Legs are what your Home is Missing. Measuring 19" X 17" X 41" and Weighing 21 Lbs, the Kitchen Stools Perfectly Go with Any Home Bar, Kitchen Island, or Outdoor Patio Area. They are Counter Height so You'll Be Able to Enjoy Meals at Your Counter with No Problem. 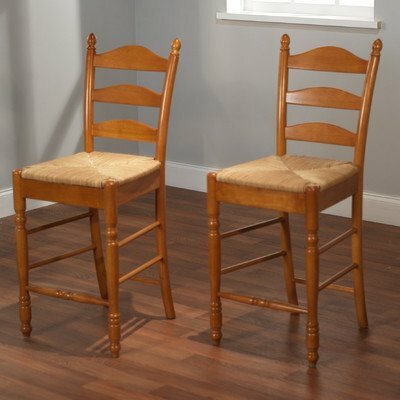 Featuring a Full Back with a Ladder Design and Expertly Woven Rush Seats , the Wooden Stools are Supportive and Stylish. With Frames Made from Fine, High Quality Rubber wood, the Stools are Durable and Built to Last. They are also Easy to Clean and Maintain. Seamlessly Fitting in with Any Home Décor, the Kitchen Stools will not Take Away from the Aesthetics of Your Home. Since 1985, Target Marketing Systems has been Offering Top-Notch Furniture at Affordable Prices. That Goal has not Changed and TMS will Continue to Give You the Best. The Rustic Stools Measure 19" X 17" X 41" and Weigh 21 Lbs. They Arrive with Only Minimal Assembly Required. Perfect for a Home Bar, Kitchen Island, or Outdoor Patio Entertainment Space, these Stools are Sleek and Offer Maximum Back Support. The Armless Design also means the Stools can Slide Underneath Tables and Countertops Flawlessly. A Vintage Design with a Modern Flair, the Wooden Stools Give your Home a Rustic Vibe. These Chairs are Truly a Timeless Piece. With a Frame Made from High Quality Rubber Wood and Expertly Woven Rush Seats, the Kitchen Stools are Strong, Long-Lasting Chairs that are also Easy to Clean.